GL Bajaj Institute of Management & Research (GLBIMR), Greater Noida has persistently focused on academic excellence delivered with holistic development of the students. 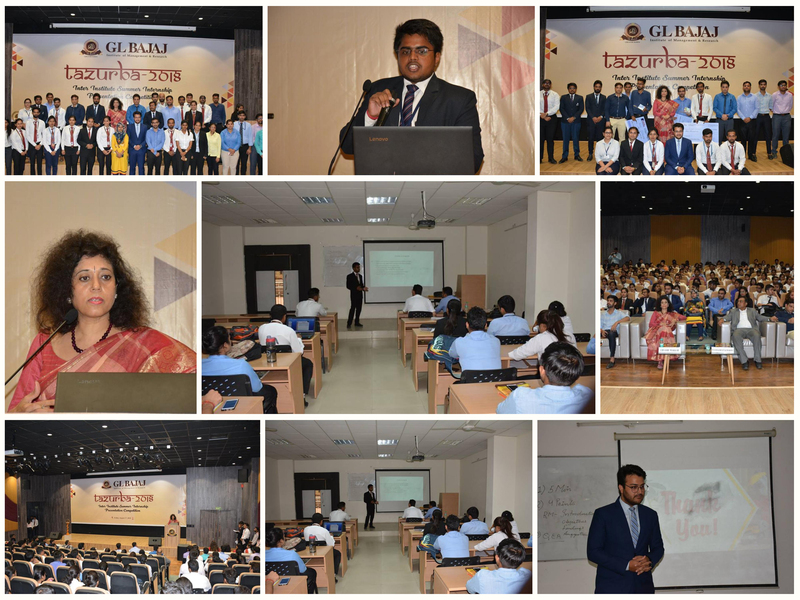 Taking forth its legacy, under the guidance of Director General Dr. Urvashi Makkar, GLBIMR organized Tajurba 2018 – "Inter-Institute Summer Internship Presentation Competition” on Friday, August 17, 2018 at its Greater Noida campus. The competition was designed for PGDM & MBA students to provide a unique platform to showcase and share their learning’s and research initiatives during Summer Internship projects to a larger audience. The glittering ceremony commenced with the chanting of auspicious shlokas of Saraswati Vandana and enlightening of ceremonial lamp by Dr. Urvashi Makkar and Chief Guest, Mr. Pullock Bhattacharjee-Vice President, BSE Institute Ltd.